Doodle La: Let Them Eat Cake! Birthdays at our house all fall close together, and so we end one year and begin the new year with lots of cake. My boys celebrate only days apart, right near (or this year ON) Thanksgiving. The girls fall days apart as well. I love cake decorating, but things can get exceedingly hectic and as much as I'd love to pay one of my amazing cake-decorating friends to make fantastic cakes or cupcakes, it's not in my budget. 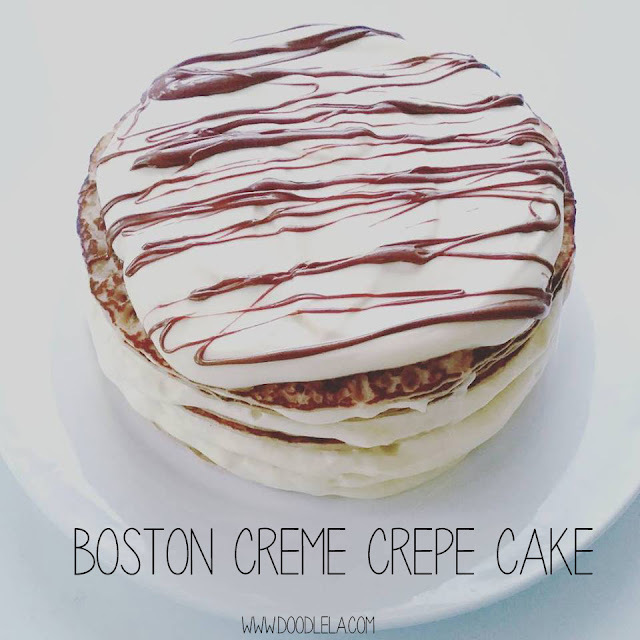 What is in my my budget, however, is this easy and delicious Crepe Cake. The thing about crepe's is that they are rich and delicious and can be transformed into what ever flavor "cake" that you desire. Fruit? Great! Lemon curd and butter cream. Sprinkle Raspberries on top. Chocolate lover? You could add cocoa powder to your batter and have a chocolate layered Crepe Cake. This year I was feeling worn from having been sick with the flu, and still being in recovery I felt incredibly lucky that my 10 year old agreed to a Crepe Cake. I took a couple of short cuts, which also made it super quick to throw together in only minutes. Read on! I bought these premade and frozen crepes, and let them defrost on the counter. When they reached room temperature I gathered the rest of my ingredients. Using a small box of vanilla pudding as my base, I folded in 1 1/2 cups of whipped cream. Let this chill a little bit in the fridge so that it will set a bit. You don't want the Cream Pie part of this Boston Cream Crepe Cake to ooz out the sides before you've completed putting all the layers together. And by the way, I did 10 layers to our cake. But you can do more of less. Next, warm a large container of Nutella, or similar Hazelnut Chocolate spread, in the microwave for about 30 seconds. It should be runny and spread smoothly. Take your chilled cream filling from the fridge and get ready to start layering the crepes. Alternate the crepe layering by spreading the Nutella on the bottom crepe. It will act as your base and hold the rest of the cake in place fairly well. Do be mindful that this cake is "fragile" and the crepes need to be treated tenderly. Make sure that your Nutella is soft enough. If it isn't, heat it 30 seconds at a time until it reaches a very very soft stage. When you have your desired height, spread your top layer with some of the cream and drizzle Nutella over the top. Pop this pretty cake into the fridge for an hour or so to cool and firm up.